>How Can You Buy And Sell The Sky? He told the 1500 assembled delegates and attendees of the this sub-national and grassroots focused conference that a biologist had recently explained to him that were all the insects to disappear, the planet would collapse within five years; Were the human race to disappear from the planet, the Earth would flourish. He then introduced a film, Harmony, that is to air tonight on NBC, inspired and narrated by Charles, the Prince of Wales. He left the podium quoting Chief Seattle’s letter to the president which includes the famous, rhetorical question, “how can you buy and sell the sky?” and reiterated the ancient teachings that the human body and the world are one, trees are but lungs. But while the first morning of the Summit concluded on a spiritual note, it was mainly spent in discussing the need for a “Green Industrial Policy” and to define the specific direction to take the Green Energy Policy in. 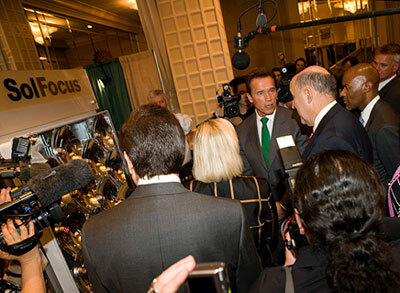 Co-host Governor Schwarzenegger addressed the assembly and made it clear that the “green revolution is moving full speed ahead.” He stressed the bipartisan victory California enjoyed recently when it collectively and overwhelmingly said “No” to Proposition 23 which sought to gut the state’s landmark global solutions act, AB 32. George Shultz, a veteran of Ronald Reagan’s cabinet shared his memories of his first cabinet position under Eisenhower. Back then, he said, Eisenhower had advised him that if the nation imported more than 20% of its oil we were “asking for trouble.” Sure enough, he recalled, two years later we had the first Arab oil embargo. Gov. Schwarzenegger at the GGCS3 at UC Davis, Mondavi Center. “How many times do you have to get hit on the head with a 2×4 before you decide to take action?” asked George Shultz. Harrison Ford took the stage after the Governor, easily following in the footsteps of Climate Action Hero. He has been a long supporter of and spokesperson for Conservation International whose main message at the summit is the carbon cost of deforestation. “Sixteen percent of all global greenhouse gas emissions is created from deforestation. That’s more than all the buses, cars, trucks on the planet combined,” said Ford. The other speakers, including Linda Adams, California Secretary of Environmental Protection, could hardly keep the “cat in the bag” until tomorrow’s official announcement about R20, an organization incorporated in Geneva, Switzerland, which is to be a “green investment program,” said Linda Adams, secretary of the California Environmental Protection Agency. It is intended to match investors from the World Bank and private corporations with local governments in developing and industrialized countries to accelerate alternative-energy projects. Adams added that today was a day to celebrate…to celebrate the victory for Mother Earth. “Protecting the environment protects our way of life…clean air, clean water, livable neighborhoods, walkable streets…”. As Ford explained it, “it will lay the tracks for the world’s first compliance market for global deforestation activity.” In other words, the developing nations will have as much economic incentive to protect the environment as they do now to strip their forests and sell the raw resources. Focus is also towards COP 16 taking place in the next few weeks in Cancun, Mexico. The Summit provides an opportunity for states and provinces to partner with and influence the position of their national governments leading up to the United Nations COP 16 conference. The GGCS3 is in partnership with the United Nations Development Programme and United Nations Environment Programme and co-sponsored by UC Davis. “The politics of climate change have challenged the science, so it is critical that universities like UC Davis – with 21st century research and development units – uncover and deliver the facts so that the world’s opinions can flow from there,” said UC Davis Chancellor Linda P.B. Katehi.